There’s lots of advice on what we work with and where we work, from chemicals to work at heights. But when it comes to when we work, it’s an entirely different matter – and, says Andrew Watterson, for shiftworkers that could be a serious problem. Shiftwork and work at night has been linked to a wide range of health problems, including breast cancer (1), prostate cancer (2), non-Hodgkin’s lymphoma (3), heightened accident risk (4), heart disease risk factors (5) and pregnancy problems (6). There is emerging evidence that these health effects combined make shiftworkers, particularly women shiftworkers, far more likely to take early ill-health retirement (7). Shiftwork may increase the risk of enforced early retirement among women. Researchers used information from just under 8,000 male and female employees, who were part of the Danish Work Environment Cohort Study, which began in 1990, and data from the national welfare register (7). Successive waves of participants in the cohort study were formally interviewed about their workplace, work patterns, health, and lifestyle. Participants were monitored until the age of 60, death, emigration, or the end of the study in June 2006, whichever came first. Of the 3,980 women included in the study, 253 had been forced to retire early on account of ill-health and had been granted a disability pension by June 2006. Of the 4,025 men, 173 had been granted a disability pension by this time. After adjusting for factors likely to influence the results, such as lifestyle, including smoking, the workplace environment, and socioeconomic status, women were more likely than men to require a disability pension. And they were 34 per cent more likely to do if they had been shiftworkers, whereas male shiftworkers were no more likely to have to retire early than other employees. This study, published in the journal Occupational and Environmental Medicine in April 2008, did not look at the reasons for enforced early retirement. Shiftwork has been associated with an increased risk of heart disease, breast cancer, peptic ulcer, sleep disturbance, complications of pregnancy and accidents. But it is not clear why women should be more vulnerable, reported the authors. ‘Plain language about shiftwork’ (9), a guide from the US government’s safety research body NIOSH, makes basic recommendations on improving shiftwork schedules. Its approach has been lifted by many other national health and safety enforcement agencies, including the UK’s Health and Safety Executive (HSE). Workplace accidents that result in injuries are much more likely to occur at night than in daytime hours, studies suggest. Kenneth N Fortson, writing in 2004 in the Monthly Labor Review,(4) highlighted data from Texas workers' compensation claims that showed the injury rate is higher late at night than during the regular 9-5 shift. Fortson looked at three possible explanations: a younger and less experienced workforce late at night; more dangerous jobs being done at night; or fatigue because night workers work longer hours. The study found that none of these were good explanations of the higher late night injury rate. Instead he concludes the human biological clock isn’t happy working in the early hours of the morning - and short term memory, reaction time and visual vigilance may be compromised as a result. He noted some workers opt to work at night, for example single mothers, because of lack of affordable childcare during the day. And businesses choose 24-hour working to optimise production. Fortson warned, however, that there is a tradeoff: night work is inherently more hazardous than day work. Some of the most catastrophic industrial disasters occurred in the early hours. Mistakes made at 1.23am led to the 1986 Chernobyl disaster; and the 1979 Three Mile Island malfunction came shortly after 4am, following mistakes by night shift workers. And while the latest TUC biennial survey of safety reps, published in October 2008, showed concern about long hours as a top health and safety concern had dropped slightly over the last six years, the trend was reversed for shiftwork, with 24 per cent identifying it as a top concern in 2008, compared to 21 per cent in 2006 and 22 per cent in 2004 (8). Shiftwork causes real health problems but these are largely hidden problems – few shiftworkers know of the risks, and the UK Health and Safety Executive (HSE) is near dormant on the issue. Since 2001/02, HSE has issued 38 improvement notices relating to the Working Time Regulations, although since 2003 no year has seen more than two notices. The two HSE prosecutions since 2001 were not on working hours-related health issues, but followed workplace fatalities. In the period from 2004/05 to 2007/08, HSE managed just 16 prosecutions on any offences related to work-related ill-health. That’s a lot of inaction on a work hazard with a potentially devastating health impact on a larger than you might think group of workers. The inaction is more lamentable because long working hours have been a recognised cause of health problems for centuries. The 1802 Act for the Preservation of the Health and Morals of apprentices in Cotton and other Mills related to controls over long working hours and prohibited work between 9pm and 6am. Railway workers campaigned for shorter hours two centuries ago on safety grounds. Fatigue has also been long associated with risks of injury at work. In 1973, Pat Kinnersly, writing in his 1973 best seller ‘The Hazards of Work’, described shiftwork as “probably the worst of all work patterns”. He went on to list the research on adverse effects of ‘shift lag’ and disturbance of the body clock that included fatigue, gastrointestinal effects and ‘nervous disorders’. Standard UK textbooks on occupational health in the early 1980s also linked rotating shiftwork and problems with the endocrine system and the circadian rhythms of the body. HSE’s shiftwork webpages say 3.5 million in the UK work shifts. 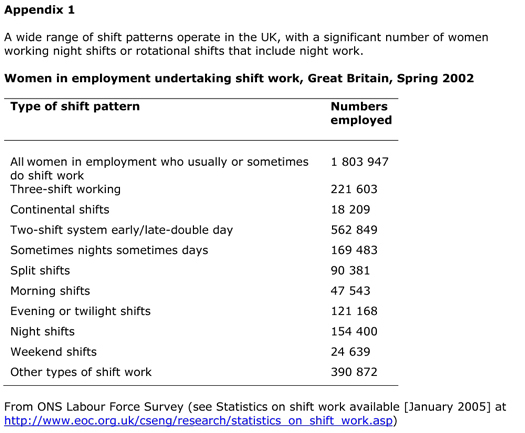 Official figures suggest approaching two million women in Great Britain usually or sometimes do shiftwork, with about 400,000 involved in night work [Appendix 1]. 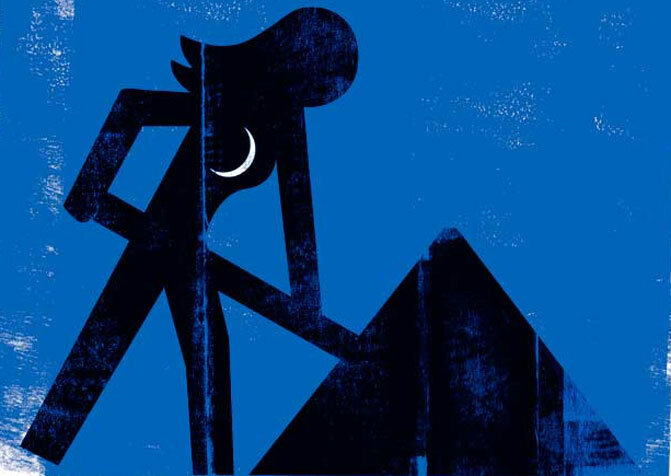 An IARC briefing on the decision noted: “Epidemiological studies have found that long-term night workers have a higher risk of breast cancer risk than women who do not work at night. These studies have involved mainly nurses and flight attendants. The studies are consistent with animal studies that demonstrate that constant light, dim light at night, or simulated chronic jet lag can substantially increase tumour development. Other experimental studies show that reducing melatonin levels at night increases the incidence or growth of tumours. The IARC working group drew on two distinct types of information: Reports of lab tests that explored mechanisms that might explain how shift work and especially night work might cause cancer; and health surveys or epidemiology papers that were smaller in number but indicated some associations between the cancer and night workers. The weighting given to the mechanisms of carcinogenicity was far higher than that given to epidemiological studies, critical to ensuring a precautionary public health approach. But it was only when reports became public of the Danish authorities recognising and compensating women with breast cancer caused by long spells on night work that the issue became a talking point in the UK. Denmark acted after the International Agency for Research on Cancer (IARC) concluded night work was a probable (group 2A) cause of cancer in humans (10). By March 2009, 38 Danish women had been compensated, mostly flight attendants and nurses, and more cases were under consideration. Shiftwork and night work affects the body’s ‘natural’ rhythms – the circadian rhythms. These rhythms may affect sleep, hunger, activity and hormones in humans. Disruptions may have direct and indirect effects on the worker. There is evidence that some workers may be less severely affected than others by different shift patterns - so there may sometimes be a degree of selection occurring among shiftworkers, where those that ‘adjust’ to a particular shift pattern continue to work those shifts, but with those that do not adjust dropping out. Opting out is only a real choice if workers really have more than a take it or leave it option – whether to work shifts and whether to work particular shifts. Often there are no choices: a job requires shiftworking and night working. Low wages and lack of employment opportunities may compel workers to take shiftwork or continue shiftwork. In recessionary times, choices vanish even faster and although some workers may be on short time and four day weeks, others may be compelled to work longer hours and more shifts as workforces shrink. Emergency workers may have no choice but to work shifts including nights. In May 2009, unions representing Australian nurses working nights submitted a claim for enhanced pay rates in recognition of the chronic health risks facing these workers, as well as the work-life balance disruption (see panel). There is some evidence that a stable shift pattern or a constant night shift pattern may be better than a rapidly changing shift system and periodic nights but, in the light of other research, avoidance of long term night work may be the better public health option. If night work has to be done, then shifts should rotate clockwise – day to evening to night with plenty of rest days between shifts and avoiding early morning starts (12). A major study published in 2005 warned that the 24-hour economy is placing women at an increased risk of breast cancer (1). Researchers from Harvard University established that regular night shifts increase the chance of developing the disease by as much as 50 per cent. The more night work that women do the higher the risk, found the study, which concluded exposure to artificial lighting could be to blame. The European Journal of Cancer paper added to a growing body of research raising concerns about the long-term health effects of shiftwork, and frequent changes between day and night duty. Many call centres are now staffed permanently, and large sections of the retail and entertainment industries are also open around the clock. For the first time, the life-threatening physical and psychological effects of shiftwork are being used to push for bigger pay packets for nurses and midwives in New South Wales, Australia. The NSW Nurses Association launched its claim in the Industrial Relations Commission in May 2009, calling in experts to cite studies linking shiftwork with higher rates of breast cancer, heart disease, miscarriage, clinical depression and divorce (13). The test case could improve remuneration for thousands of shiftworkers in other professions who have spent decades battling its effects. “The reality is after a lifetime of nursing there are effects. Somebody has to work the night duty because hospitals operate 24 hours a day, seven days a week,” the union's general secretary, Brett Holmes, said. Professor Ron Grunstein, a sleep expert from the Woolcock Institute of Medical Research, said the ill effects of working nights could not be ignored. During five hours in the witness box, he cited evidence from studies that included more than 100,000 nurses in the United States and showed those on night duty experienced increases in coronary artery disease, breast cancer, weight gain, eating disorders, miscarriage, premature birth and low birth weight. “In the 1970s, it was thought the effects of shiftwork were minor and transitory, but we know better now,” he said. In 2008, the Australian Workers Union (AWU) called for a review of working hours after the International Agency for Research on Cancer warned people who worked night shifts had a higher risk of contracting breast and prostate cancer (14). The circadian rhythms are controlled by chemicals that come from a small gland in the brain, the pineal gland. This gland is part of the endocrine system which produces hormones. The chemicals produced affect sleep patterns, appetite and other mechanisms in the body. There is some evidence that these chemicals will also affect the immune system which can in turn affect human health. They can also cross into the fetus and may affect some aspects of reproduction. The main chemical involved is melatonin and more and more lab tests indicate that melatonin produced in the body may be a key chemical in protecting from some diseases and its lack may contribute to some diseases, directly and indirectly. This is the so-called ‘light at night’ issue. Melatonin levels drop during daylight and, when humans are sleeping, the levels increase. So light at night adversely affects humans although the exact effects of the number of hours of light at night and the intensity of the light that humans are exposed to is not known. If sleep patterns are affected, this will also influence fatigue, capacity to take physical exercise, times of eating meals and so on. This is where direct and indirect effects of shiftwork and night work may come together. Sleep in the day may also be affected by external factors such as noise from daylight activities. Some studies have shown that shiftworkers and night workers put on weight. This may link directly to the effects of their work patterns and their circadian rhythms controlled by the pineal gland or it may relate indirectly to the times they have to eat meals or the access to canteen food or the availability of healthy food. Working at night too may increase both the consumption of tobacco and caffeine. These work-affected dietary and lifestyle issues may all be contributory factors to gastrointestinal diseases such as ulcers, the risks of cardiovascular diseases which studies have suggested are increased by 40 per cent in shift workers (12) and diseases such as cancer, rather than just ‘confounders’ of other causes. The International Agency for Research on Cancer (IARC), the cancer arm of the World Health Organisation, first said in 2007 that it would classify overnight shiftwork as a probable human carcinogen after evidence was considered by a meeting of experts (10). Three years earlier, in an HSE-commissioned evaluation of epidemiological studies on the issue concluded “the possibility that shift work per se increases the risk of breast cancer cannot be dismissed, but on the other hand it remains possible that the apparent associations are due to confounding.” (15). Several studies have found that women working at night over many years are more prone to breast cancer. Some research also suggests that men working at night may have a higher rate of prostate cancer. Lack of adequate studies has hampered early recognition of the problem and has meant preventive action has been lacking. A Danish occupational physician’s review of the evidence, based on epidemiological studies, reached the conclusion that there was limited evidence – that is some, but as yet not conclusive, evidence - for a causal association between nightshift work and breast cancer, while there was insufficient evidence for prostate cancer, colon cancer, and overall cancer (16). The author expressed concern that health surveys (epidemiological studies) involved small numbers, that detailed information about the nature of shiftwork done in the studies was lacking, and that light at night exposure was not documented. However, a more worrying picture emerges when you take into account the lab based studies that convinced the IARC researchers to list shiftwork and night work as a “probable” cause of cancers in humans. A 2006 US study looked at 115,022 women without cancer of whom 1,352 developed invasive breast cancer during a 12 year follow up. Women who reported more than 20 years of rotating night shiftwork experienced an elevated relative risk of breast cancer compared with women who did not report any rotating night shiftwork. There was no increase in risk associated with fewer years of rotating night work. The authors suggested a modestly elevated risk of breast cancer after longer periods of rotating night work and noted additional studies were warranted to rule out small sample size or uncontrolled sources for confounding as alternative explanations (17). In the same year, Lie carried out a case-control study, nested within a cohort of 44,835 nurses educated between 1914 and 1980 based on a registry of all Norwegian nurses (18). Four controls were individually matched by year of birth to each of 537 breast cancer cases that occurred during the period 1960-1982. The reconstruction of work history and number of years with night work for each nurse was based on information from the nurse registry, and data from three censuses. The adjusted odds ratio of breast cancer among nurses who worked nights for 30 or more years was 2.21 (CI 1.10-4.45) compared with those who did not work nights after graduation from nursing school – long-term night nurses were more than twice as likely to get breast cancer. Lie concluded their results were in accordance with previous studies that found an association between night work and breast cancer risk among women. I'm a consultant anaesthetist who developed breast cancer at the age of 35 after life as a junior doctor doing the old style 84-hour contracts and 1-in-3 on call rotas with massive sleep deprivation. It's not clear whether female anaesthetists or doctors have a higher incidence than would be expected but I have four other anaesthetic colleagues who have had pre-menopausal breast cancer without a family history. We have been reflecting on our experiences and risk factors and are very interested that the Danish government has taken this step. It has huge implications for health care workers and 50 per cent of the current medical graduates are females. I am a nurse who has worked a lot of nights in my career. My story in brief is that I am a theatre sister at my local hospital. I have a rotational shift pattern now but for many years I worked a set night every week. I have worked in theatres since 1974 and have always had a night work commitment. I was diagnosed with non-Hodgkin's lymphoma in 1998. I was picked up at breast clinic. I was vaguely aware of the breast cancer link but had not been aware of the link to lymphoma. I am surprised that the association hadn't touched on this but it may be that I have missed it. I have been doing nightshift work for over 34 years. I work in a Fire and Rescue control room. I am 55 years of age and I am healthy so far. There are quite a number of other staff who have also worked the same shifts as myself for over 20 years. The shift system we work is the same as the operational firefighters - that is 2 x 10 hour dayshifts and 2 x 14 hour night shifts. Firefighters can retire after 30 years service or by age 55 - whichever comes first. However, control staff work on until age 60 or 65 years. In the future the operational firefighters will also be expected to work until they are 60 years of age. This translates into working night shifts for 40 years plus assuming a person begins their career at 18 years old. I believe (this) is unhealthy with unrealistic expectations of a working person. I have been on dayshift since 1 January 2009 and I feel good, I sleep better, eat at regular times and my stomach isn’t complaining anymore. I will have to return to shiftwork for the rest of my career (five years) and I am concerned because I strongly believe that health is wealth! Japanese researchers explored the risk of prostate cancer in shiftworkers by examining prospectively the association between shiftwork and risk of prostate cancer incidence among 14,052 working men in Japan enrolled in a large-scale prospective cohort. During 111,974 person-years, 31 cases of prostate cancer were recorded. The study, with small numbers involved, adjusted for age, family history of prostate cancer, study area surveyed, body mass index, smoking, alcohol drinking, job type, physical activity at work, workplace, perceived stress, educational level, and marriage status. Compared with day workers, rotating-shift workers were significantly at risk for prostate cancer, with a risk three times the expected rate (relative risk = 3.0, 95 per cent confidence interval: 1.2, 7.7). Fixed-night work was associated with a small and non-significant increase in risk (2). Another more recent study looked at satellite measurements of light emissions at night and cancer rates in 164 countries. Countries that emitted most light at night tended to have the highest prostate cancer rates of around 157 cases per 100,000 men, compared with about 67 per 100,000 among the countries with the lowest night time light emissions. The United States, which has among the highest night time light emissions, has a prostate cancer rate of about 125 cases per 100,000. Bangladesh, which has the lowest night time light emissions, has less than one case per 100,000 (19). Lung and other cancers did not show up as excessive in this study which would be consistent with the hormonal explanation for such tumours being related to circadian rhythms. A relatively large 2008 Finnish study looked at whether non-Hodgkin lymphoma (NHL) was more common than expected among night-time shiftworkers. The Finnish job-exposure matrix (FINJEM) was used to provide estimates of the proportion of exposed persons and the mean level of exposure among the exposed in each occupation. The probability of night time work in each occupation was assessed, the observed and expected numbers of cancer cases during the years of 1971–1995 calculated in a cohort of persons born in 1906–1945, and the cumulative index of night-time work was scored. A total of 1,669,272 persons were in the cohort of whom 6,307 (3,813 men and 2,494 women) had NHL during the follow-up. This study found night-time work significantly increased the risk of NHL in men. The risk ratio was 1.28 (1.03–1.59) for men who worked in night-time shifts to a high degree as compared with those who had not been exposed to night-time work – in other words, 28 per cent higher. The authors concluded night-time workers were cancer prone and have a greater risk of NHL than population on average (3). Other studies have linked night work with endometrial cancer. One looked at 121,701 women enrolled in a prospective cohort study, where 53,487 women provided data on rotating night shift work and there were 515 women with endometrial cancer. They found women who worked for more than 20 years of rotating night shifts had a significantly increased risk of endometrial cancer, particularly if they were obese. The authors speculated that this increased risk was attributable to the effects of melatonin on hormonal and metabolic factors (20). The Kolstadt review (16) was produced before a larger Swedish cohort study was published in 2007. This more recent study looked at 2,102,126 male and 1,148,661 female workers who worked in both 1960 and 1970. Their jobs were classified according to the percentage of shiftworkers, and they were followed from 1971 through 1989 or until they were diagnosed with cancer or died. Standardised incidence ratios (SIR) were used to compare the adjusted cancer incidence rates for shiftworkers with those for non-shift workers. This 2007 study found cancer rates were not elevated for the male shiftworkers or for the female shift workers and the researchers concluded that no evidence was found for an association between shiftwork and breast or prostate cancer, or all cancer sites combined among shiftworkers (21). However, as later commentators noted “the authors and an accompanying editorial pointed to shortcomings of this ecological study, in particular with regard to the possible misclassification of exposure as a consequence of the used aggregated, rather than individual exposure information” (22). In April 2009, a review by Danish researchers reported there was limited evidence for a link between night work and ischaemic heart disease (23) – this means the evidence available indicated there was a link, but there wasn’t enough evidence of good enough quality as yet to draw a definitive conclusion. Japanese researchers in 2005 concluded people who work rotating shifts may face a greater risk of developing heart disease than those who work fixed days or fixed nights only (5). The report showed that men who worked rotating shifts were 60 per cent more likely to have a disease of the heart and blood vessels than those who worked day shifts and were over twice as likely to die of heart disease. However workers who had other risk factors such as high blood pressure were more than three times more likely to die of heart disease than day workers with high blood pressure. No such increase was found among men who worked fixed nights. In the past, health differences among people working different shifts have been put down to the fact that people who worked some shifts were more likely to smoke than those who worked days, however the Japanese study found there was a significant increase even after the figures had been adjusted for other risk factors. The hormonal effects, sleep disturbance, fatigue and immune impacts of shiftwork and night work could present a range of potential risks to both male and female reproductive processes. There is some evidence too that the hormone melatonin produced by the pineal gland crosses the placenta and may provide protection from certain conditions that threaten the fetus and the mother. In 2005 in Denmark researchers looked at more than 40,000 Danish women who worked during the day, evenings, nights, and those who worked rotating shifts (24). They found no statistically significant differences in the length of pregnancy or the birth weight of the baby among women when comparing all non-daytime shifts with those who worked only during the day. However, when they looked at night shift workers, they found a high risk of post-term birth; fixed evening workers had a high risk of full-term low birth weight; and shift workers as a group showed a slight excess of low-weight babies. Low birth weight is seen as a warning sign for bad health in a baby, with these babies having a higher mortality and morbidity rate. The researchers concluded: “Night work may prolong the duration of pregnancy and reduce fetal growth, especially among industrial workers”. In the UK, precise statistics on the numbers working atypical hours are hard to come by. According to the Health and Safety Executive (HSE): “There is no specific definition of shift work in law, but it is usually taken to mean a work activity scheduled outside standard daytime hours, where there may be a handover of duty from one individual or work group to another; a pattern of work where one employee replaces another on the same job within a 24-hour period” (11). This is likely to amount to a significant proportion of the UK workforce. In Europe, the estimate is that around 20 per cent of the workforce is employed on shifts. HSE estimate that “more than 3.5 million people are employed as shift workers in the UK. They work in a wide variety of industries including the emergency services, healthcare, the utilities, transport, manufacturing (including oil, gas & chemical industries), entertainment and retail” (25). Labour Force Survey (LFS) data suggest an estimated 1.8 million women in Great Britain usually or sometimes do shift work. Of these, an estimated 400,000 are involved in night work - night shift, continental shift and three-shift working. In October 2008, the workplace conditions of those working after dark received a rare flurry of official scrutiny. Inspectors from the Health Safety Executive (HSE) and local authority environmental health departments in the South West of England took part in a joint initiative from 13 October to 30 October that focused on issues including management and supervision, training, transport, working at height, slips and trips and language - for example, where migrant workers are present. Night workers frequently complain of lone working, lack of supervision, training and first aid support, and lack of access to welfare facilities like canteens that are available to the day shift. And the chances of those employers abusing their night workers facing “robust” official action is pretty remote, as these night time blitzes occur once every blue moon. HSE news release, 7 October 2008. In the past, shiftwork and night work was done by industrial workers in unskilled, semi-skilled and skilled occupations and by a range of emergency workers. This meant the health and safety risks were unevenly distributed across UK society. Now more white collar workers may be doing shift and night work. But the directors’ car park still empties before the start of the night shift, and the tea-time exodus frequently takes with it some and sometimes all of the safety officers and first aiders. And with an understaffed HSE now only visiting the average workplace less than once every 14 years, the night shift is almost entirely beyond official scrutiny too. HSE’s website makes plain that, unlike the health service or other criminal law enforcers like the police, normal service is not available outside of office hours (26). “In our experience, most incidents may be satisfactorily investigated during normal working hours,” its out of hours contact page says. Not that HSE is enforcing on these issues. It told Hazards the few enforcement notices that are issued are “principally in relation to failure to provide free medical assessments or in relation to record keeping.” The Working Time Regulations give workers an entitlement to a free health assessment prior to undertaking nightwork, and at “regular intervals” while on nights. Overall, HSE is not being proactive on the issue, particularly as it relates to possible cancer risks. Responding to questions on IARC’s breast cancer warning, the UK watchdog said it would take no action until research it has commissioned on breast cancer and night work is finalised in 2011. However, the HSE-backed study does not cover the same ground as the IARC (10) and Danish (16) reviews and begs the question why HSE cannot accept the IARC assessment of carcinogenicity, made by a 24-strong panel of experts from 10 countries, which was considered authoritative enough to trigger action on both compensation and enforcement by the Danish authorities. HSE’s wait-and-see, do-nothing approach is in stark contrast to Denmark’s labour inspectorate leadership. This is now looking at enforcing their laws on shifts and nights , from the health perspective, in an even more rigorous manner than they did prior to the decision to make breast cancer a compensated occupational disease. The Danish authorities are focusing enforcement activities on hazardous shiftwork schedules, especially the combination of long working hours, night work and counter-clock work schedules, measures that will benefit workers facing both safety and health risks from unsatisfactory work patterns. The general sections of the Health and Safety at Work Act 1974 cover employers’ responsibilities, including health and safety risks to shiftworkers. And the risk assessment and other duties in the Management of Health and Safety at Work Regulations also apply to shiftwork. HSE says the Working Time Regulations (28) are “relevant to the planning and organisation of shifts, especially night shifts. Some workers in certain sectors such as the railway and aviation industries and mobile workers in road and sea transport may also be subject to industry-specific legislation, which lay down specific requirements in relation to the organisation of working time” (25). Risk assessment and related risk management flow from these regulations. Enforcement of the regulations, according to government information, is “split between different authorities. The limits and health assessments (if a night worker), are enforced by the Health and Safety Executive, local authority environmental health departments, the Civil Aviation Authority (CAA), the Vehicle and Operator Services Agency (VOSA) and Office of Rail Regulation (ORR). The entitlements to rest and leave are enforced through employment tribunals” (28). HSE observed in 2008 that “applying the good practice guidelines, so far as it is reasonably practicable to do so, will help reduce the risk that workers are exposed to by shift working” (25). The working time regulations state that an “adult worker must have the opportunity for a free health assessment before being assigned night work with regular re-assessments later.” But how “opportunity” is interpreted and who carries out the assessments and re-assessments is not specified. Other laws allow for special cases where regulations on night work may be disapplied - this covers hospitals, prison, docks, airports, R&D, agriculture, tourism, postal services and 'cases of emergency'. These are just some of the opt outs. Regulation 20 for instance allows for the disapplication of night work regulations where there is “unmeasured work time” which could de facto affect a wide range of employees who have “voluntary” discretion over their workload and some self-regulation of their work. UK workers still work the longest hours in Western Europe according to a 2008 report from Eurofound - the European Foundation for the Improvement of Living and Working Conditions. Only workers in Bulgaria and Romania average longer hours, leaving the UK 25th out of 27 European countries in the working hours league table. (29). Few workers have access to effective occupational health services. In 2006, the Department of Work and Pensions reported “only 15 per cent of firms provided even basic occupational health support, with only 3 per cent providing comprehensive support” (30). A recent cash boost for NHS based occupational health services available to some local businesses, is unlike to dramatically change this statistic. With such low occupational health coverage and such widespread use of shiftwork and night work, there have to be serious questions about the effectiveness of any regular health checks for night workers and shiftworkers. It also raises the further question of how well employers are capable of conducting effective and continuing health surveillance of vulnerable shiftworkers and night workers. Why do they blame lifestyle? Cancer research charities dominate the policy making area, and generate very large sums from public donations primarily to investigate the mechanisms of cancers and research on the treatment of the diseases. Their key ‘prevention’ work is historically based on screening and exhorting people to change their lifestyle. Occupational and environmental risks are generally played down and sometimes dismissed entirely. Responding to reports on the Danish decision to compensate long-term night workers with breast cancer, Breakthrough Breast Cancer commented: “Whatever their working hours, all women can help reduce their risk of developing the disease by maintaining a healthy weight, taking regular exercise, and limiting the amount of alcohol they drink” (31). This group has routinely dismissed occupational and environmental factors in breast cancer causation, despite an increasing recognition of the problem in the medical literature and by international agencies. At Cancer Research UK, senior science information officer Dr Kat Arney, commented: “A number of studies link nightshift work with breast cancer risk. But this has not been conclusively shown. “At the moment we don't know how other lifestyle factors - such as taking HRT, obesity, having fewer children and alcohol consumption - interact with shiftwork to increase a woman's risk of breast cancer. Nor do we know how many years of shiftwork might have a significant impact on risk. Another problem is that most studies have only looked at specific occupations rather than shift workers in general” (32). This twin strategy of requiring ever more evidence before acting on a possible – in this case, according to IARC, “probable” – occupational risk and emphasising lifestyle is damaging in two respects. Firstly it switches focus away from the changes needed in shiftwork practices, and secondly it ignores the proven association between shiftwork and weight increase, lack of time or opportunity to take exercise and a tendency to drink more alcohol – the answer to these problems is not improving personal behaviour, it is improving a person’s working conditions. 1. UK workers are protected from the adverse health effects of shiftwork and night work. Wrong: There is little guidance and even less enforcement of working hours patterns in the UK, particularly out-of-hours working. On breast cancer, instead of accepting the IARC evidence, HSE is waiting until its own research is published in 2011 to consider further action. 2. The UK compensation system is just. Wrong: When it comes to occupational cancer, if you take out those caused by asbestos only a handful of workers receive compensation each year from either the common law or the state industrial diseases benefits systems - and none of these payouts have ever been for cancers related to working patterns. 3. It’s mainly women who are at risk. Wrong: Risks to women in the workplace will inevitably be risks to men. Shiftwork and night work affect the male and female hormonal systems and can have a detrimental impact on sleep and diet. Women may get the breast cancers, but it’s men that get the prostate cancers. And the other effects, like heart disease, will affect you whatever your gender. The medicalised and pharmaceutical approach embraced so enthusiastically by many medical research charities has gone one step further because there are suggestions that supplements of melatonin will be the answer for shiftworkers. Yet we do not yet know what effect such supplements may have in the middle- and long-term. • Unions should ensure wherever possible their safety rep cover includes workers on atypical shifts, including night shifts. Workload Plan an appropriate and varied workload. Choice Offer a choice of permanent or rotating shifts and try to avoid permanent night shifts. Rotate Either rotate shifts every 2-3 days or every 3-4 weeks - otherwise adopt forward rotating shifts. Best fit Avoid early morning starts and try to fit shift times in with the availability of public transport. Hours	limit Limit shifts to 12 hours including overtime, or to 8 hours if they are night shifts and/or the work is demanding, monotonous, dangerous or safety critical. Breaks Encourage workers to take regular breaks and allow some choice as to when. Vulnerable	workers Consider the needs of vulnerable workers, such as young or aging workers and new and expectant mothers. Consecutive days Limit consecutive work days to a maximum of 5-7 days and restrict long shifts, night shifts and early morning shifts to 2-3 consecutive shifts. Sleep	time Allow two nights full sleep when switching from day to night shifts and vice versa. Weekends Build regular free weekends into the shift schedule. Facilities Provide similar facilities as those available during daytime and allow shiftworkers time for training and development. Welfare Ensure temperature and lighting is appropriate and preferably adjustable. Training Provide training and information on the risks of shiftwork and ensure supervisors and management can recognise problems. Supervision Consider increasing supervision during periods of low alertness. Shift	management Control overtime, shift swapping and on-call duties and discourage workers from taking second jobs. Handovers Set standards and allow time for communication at shift handovers. Communication Encourage interaction between workers and provide a contact for lone workers. Health assessments Encourage workers to tell their GPs they are shiftworkers and provide free health assessments for night workers. Security Ensure the workplace and surroundings are well lit, safe and secure. 1. Sarah Megdala and others. Night work and breast cancer risk: A systematic review and meta-analysis, European Journal of Cancer, volume 41, issue 13, pages 2023-2032, 2005. 2. Tatsuhiko Kubo and others. Prospective cohort study of the risk of prostate cancer among rotating-shift workers: Findings from the Japan Collaborative Cohort Study, American Journal of Epidemiology, volume 164, pages 549-555, 2006. 3. T Lahti and others. Night-time work predisposes to non-Hodgkin lymphoma, International Journal of Cancer, volume 123, pages 2148–2151, 2008. 4. Kenneth N Fortson. The diurnal pattern of on-the-job injuries, Monthly Labor Review, pages 18-25, September 2004 [pdf]. 5. Y Fujino and others. A prospective cohort study of shift work and risk of ischemic heart disease in Japanese male workers, American Journal of Epidemiology, volume 164, pages 128-135, 2006. 6. Lisa A Pompeii others. Physical exertion at work and the risk of preterm delivery and small-for-gestational-age birth, Obstetrics & Gynaecology, volume 106, pages 1279-1288, 2005 [abstract]. 7. Finn Tüchsen, Karl Bang Christensen, Thomas Lund, and Helene Feveile. A 15 year prospective study of shift work and disability pension, Occupational and Environmental Medicine, volume 65, pages 283–285, 2008. 8. TUC biennial survey of safety reps 2008, October 2008. 10. Kurt Straif and others.Carcinogenicity of shift-work, painting, and fire-fighting. The Lancet Oncology, volume 8, number 12, pages 1065-1066, December 2007. IARC news release, 5 December 2007. 0 7176 6197 0, HSE Books. 12. Seward and Larsen in: J Ladou. Occupational and Environmental Medicine. 4th ed., 2004. McGraw Medical, New York, pages 585-586. 13. NSW nurses seek higher night shift pay, NSWNA news release, 3 May 2009. 14. Night work 12-hour shifts can trigger cancer – AWU praises new UN Report, AWU news release, 7 January 2008. 15. A Swerdlow. Shift work and breast cancer; a critical review of the epidemiological evidence, Research Report 132, ISBN 0 7176 2708 X, Health and Safety Executive, 2003 [pdf]. 16. HA Kolstad. Nightshift work and risk of breast cancer and other cancers - a critical review of the epidemiologic evidence. Scand J Work Environ Health, volume 34, number 1, page 5–22, 2008.
cancers: a critical review of the epidemiological evidence, 2008. 17. ES Schernhammer, CH Kroenke, F Laden and others. Night work and risk of breast cancer, Epidemiology, volume 17, number 1, pages 108-11, 2006. 18. LA Lie, J Roessink, K Kjaerheim. Breast cancer and night work among Norwegian nurses, Cancer Causes Control, volume 17, number 1, pages 39-44, 2006. 19. I Ikloog, A Haim, RG Stevens and others. Global co-distribution of light at night (LAN) and cancers of prostate, colon, and lung in men, Chronobiology International: The Journal of Biological and Medical Rhythm Research, volume 26, number 1, pages 108–125, 2009. 20. AN Viswanathan, SE Hankinson, ES Schernhammer. Night shift work and the risk of endometrial cancer, Cancer Research, volume 67, number 21, pages 10618-22, 2007 [abstract]. male and female shift workers, Scand J Work Environ Health, volume 33, number 5, pages 336-43, 2007. Health, volume 35, number 1, pages 74-79, 2009. 24. JL Zhu, NH Hjollund and J Olsen. Shift work, duration of pregnancy, and birth weight: The National Birth Cohort in Denmark, American Journal of Obstetrics and Gynecology, volume 191, number 1, pages 285-291, 2004 [abstract]. 25. HSE shiftwork webpages, updated 11 August 2008, accessed 9 May 2009. 26. HSE out of hours contact webpage, accessed 9 May 2009. 27. HSE good practice guidelines, accessed 9 May 2009. 28. Working Time Regulations, BERR website. 29. Working time developments – 2007, European Foundation, 1 September 2008. Eurofound news release and full report. 30. OHS SOS, Hazards magazine, number 99, July-September 2007. 31. Safety and Health Practitioner, page 7, April 2009. 32. Denmark compensates women who develop cancer after working night shifts, Cancer Research UK news release, 18 March 2009. 33. V Gennaro and L Tomatis. Business bias: How epidemiologic studies may underestimate or fail to detect increased risks of cancer and other diseases. International Journal of Occupational and Environmental Health, volume 11, number 4, pages 356-359, October-December 2005 [abstract]. Work hazards prevention kit: Part 1, Hazards magazine, 2007. • Why do they blame lifestyle?